In February we wrote about Linked Data basics and resources but only briefly mentioned its application by library vendors. In this post we’ll look deeper into existing and future library applications and services from major library vendors that implement Linked Data. 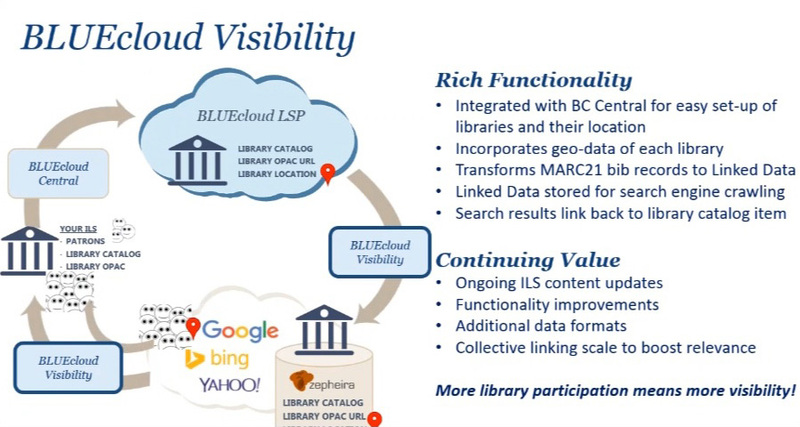 Before the BIBFRAME model began development, OCLC was already experimenting with Linked Data using the Schema.org model and worked toward expanding its vocabularies to include bibliographic data. BLUEcloud Visibility was announced in a press release on January 7, 2015. SirsiDynix partnered with Zepheira to create this add-in product to work with SirsiDynix’s existing products. They created a pilot program with Douglas County Libraries. Currently only library catalog data is included, but the company plans to extend to electronic resources. Currently there is no real-time item availability. Records will be updated twice a month. Read more on SirsiDynix’s BLUEcloud Visibility page. 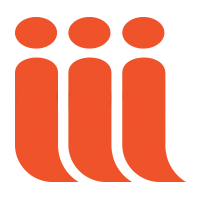 Innovative Interfaces is an active sponsor of the Libhub Initiative. In August 2015 they published The ILS and Linked Data: A White Paper to explain why the company was adopting Linked Data and answers some questions about it. On March 16, 2016, Innovative Interfaces and Zepheira announced a partnership to use Zepheira’s Linked Data technology in Innovative’s new Innovative Linked Data service. “Innovative Linked Data is available immediately as a subscription service for Polaris, Sierra, Millennium, and Virtua library systems” according to the press release. 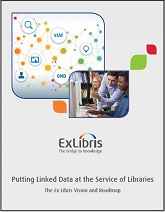 In January, Ex Libris announced that the company launched a program to “harness linked data technology in its resource management and discovery solutions” and published the paper Putting Linked Data at the Service of Libraries. The paper details how Ex Libris will enrich products such as their Alma resource management service and Primo discovery service with Linked Data both as a source and a consumer. 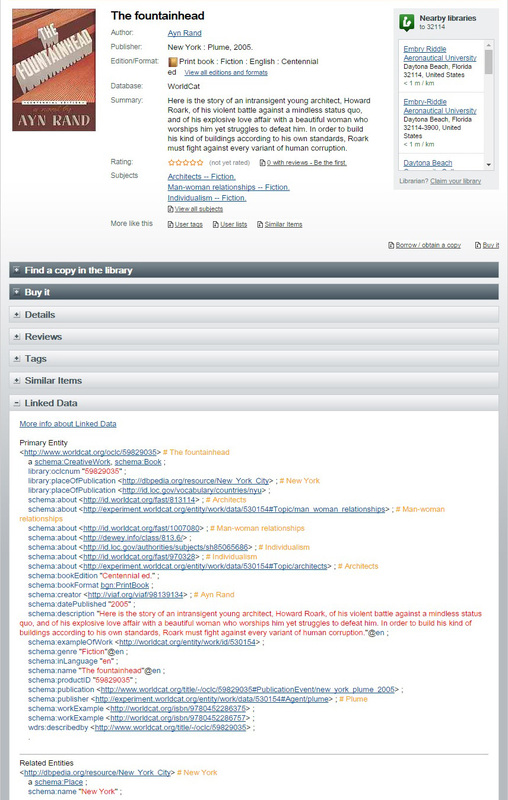 Future versions of Alma will ingest BIBFRAME records and enable cataloging librarians to utilize global online authority files such as VIAF for author/creator authority records, Library of Congress Linked Data Subject Headings, and GeoNames geographical place names database. The next Primo user interface will include Linked Data features to enhance search results. Linked Data will, of course, increase the exposure of the library’s resources to third-party applications and the Web at-large. Ex Libris is working with its user groups to form Linked Open Data Special Interest Working Groups to help develop and test Linked Data features in the products mentioned. Collaborating libraries include those at Boston College, University of Oklahoma, and University of Amsterdam. With two recent announcements of mergers of well-known library vendors—ProQuest acquired Ex Libris and Bibliotheca bought 3M Library Systems—the number of independent library vendors is shrinking. ProQuest is now a provider of research databases (ProQuest Central and others), ebooks (ebrary, EBL, and MyiLibrary), discovery tools (Summon and now Primo), link resolvers (Serials Solutions and now SFX), library management system (Alma and Intota), and print books (with the recent purchase of Coutts). EBSCO is the next largest vendor in this shrinking field. EBSCO offers research databases (EBSCOhost), ebooks (EBSCO eBooks and Audiobooks), a discovery tool (EBSCO Discovery Service), a link resolver (LinkSource), and print books (YBP Library Services). EBSCO does not offer an ILS or LMS and one has to wonder if the company will go looking to acquire one. OCLC is the third major competitor in the library services arena. OCLC does not provide content like ProQuest and EBSCO. However, they offer a discovery tool (WorldCat) and a modern library management system (WorldShare Management Services). OCLC also offers popular services such as a proxy service (EZproxy), interlibrary loan service (ILLiad), digital collection management tool (CONTENTdm), and a virtual reference system (QuestionPoint). If your library is looking for a comprehensive library management / discovery service / link resolver solution, you now have three vendors. Ithaka S+R: What Are the Larger Implications of ProQuest’s Acquisition of Ex Libris?